[155 Pages Report] The aircraft line maintenance market is projected to grow from USD 18.47 Billion in 2017 to USD 23.50 Billion by 2023, at a CAGR of 4.10% from 2018 to 2023. The objective of this study is to analyze, define, describe, and forecast the aircraft line maintenance market based on service, type, aircraft type, technology, and region. The report also focuses on providing a competitive landscape of the aircraft line maintenance market by profiling companies based on their financial positions, product portfolios, and growth strategies. The study also analyzes the core competencies of companies and their market shares to anticipate the degree of competition prevailing in the market. This report tracks and analyzes competitive developments such as contracts, new product launches, agreements, joint ventures, and partnerships in the aircraft line maintenance market. The base year considered for this study is 2017 and the forecast period is from 2018 to 2023. 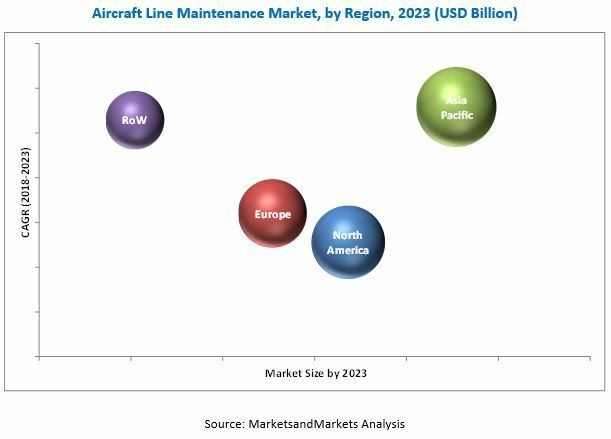 The aircraft line maintenance market has been segmented based on service, type, aircraft type, technology, and region. AMECO (China), ANA Line Maintenance Technics (Japan), Avia Solutions Group (Lithuania), BCT Aviation Maintenance (UK), British Airways (UK), Delta TechOps (US), HAECO (Hong Kong), Lufthansa Technik (Germany), Monarch Aircraft Engineering (UK), Nayak Group (Germany), SAMCO Aircraft Maintenance (Netherlands), SIA Engineering (Singapore), STS Aviation Group (US),Turkish Technic (Turkey), and United Technical Operations (US), among others are the key players operating in the aircraft line maintenance market. Contracts, new product launches, agreements, joint ventures, and partnerships are the major strategies adopted by the key players in the aircraft line maintenance market. The aircraft line maintenance market is projected to grow from USD 19.23 Billion in 2018 to USD 23.50 Billion by 2023, at a CAGR of 4.10% from 2018 to 2023. The growth of the aircraft line maintenance market across the globe can be attributed to the increasing number of flights per aircraft, rising number of new aircraft deliveries from OEMs, and increasing requirement for carrying out repair and maintenance of the existing aircraft fleets of airlines. Based on service, the aircraft line maintenance market has been segmented into component replacement & rigging service, defect rectification service, engine & APU service, Aircraft on Ground (AOG) service, and line station setup & management service. The component replacement & rigging service segment is projected to lead the aircraft line maintenance market during the forecast period. The increased demand for component replacement & rigging services by various airlines for the replacement of their existing legacy aircraft systems is driving the growth of the component replacement & rigging service segment of the aircraft line maintenance market. The component replacement & rigging service segment has been further classified into hydraulic leak rectification, structural repairs, landing gear replacement & removal, windshield changes, and avionics repairs. Based on type, the aircraft line maintenance market has been segmented into transit checks and routine checks. The routine checks type segment is projected to grow at a higher CAGR as compared to the transit checks segment from 2018 to 2023. Routine checks of an aircraft comprise maintenance pre-flight checks, post-flight checks, service checks, overnight checks, and weekly checks. When an aircraft completes 155 hours of flight, it goes for fill or change of oils and fluids such as hydraulic fluid, starter oil, engine oil, and generator drive fluids. As the number of flights per aircraft is rising, it is projected to lead to an increased requirement for routine checks of aircraft. Based on aircraft type, the aircraft line maintenance market has been segmented into Narrow Body Aircraft (NBA), Wide Body Aircraft (WBA), Very Large Aircraft (VLA), Regional Aircraft (RA), and others. The wide body aircraft type segment of the aircraft line maintenance market is projected to grow at the highest CAGR during the forecast period. The growth of this segment of the market can be attributed to the increased the number of deliveries of new wide body aircraft across the globe. Wide body aircraft are jet carriers with a fuselage, which is sufficiently wide enough to accommodate two traveler walkways. These aircraft are twin-aisle aircraft, with at least seven seats abreast. Aircraft series such as A330 series, A350 series, B767 series, B787 series, and B777 series are included under the wide body aircraft type segment of the aircraft line maintenance market. 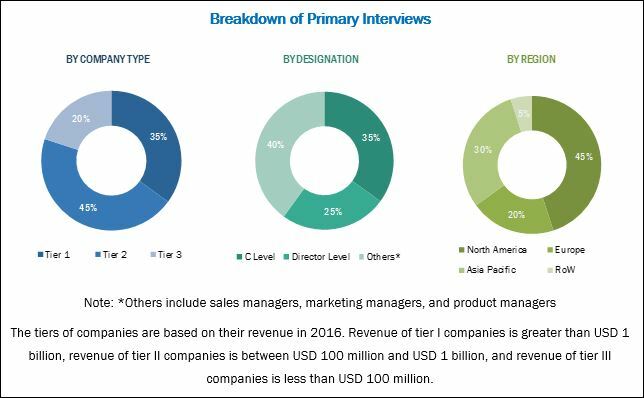 In this report, the aircraft line maintenance market has also been analyzed with respect to 4 main regions, namely, North America, Europe, Asia Pacific, and Rest of the World (RoW). The aircraft line maintenance market in the Asia Pacific region is projected to grow at the highest CAGR from 2018 to 2023. The growth of the Asia Pacific aircraft line maintenance market can be attributed to the increase in the aircraft production in the region and rise in the number of new aircraft delivered. Moreover, increased demand for MRO services from the region is expected to drive the growth of the Asia Pacific line maintenance market from 2018 to 2023. China, India, and Japan are the key markets for aircraft line maintenance in this region. The China aircraft line maintenance market is projected to witness significant growth during the forecast period, owing to the presence of several key providers of aircraft line maintenance services that include AMECO (China) and HAECO (Hong Kong) in the country. The rise in spending of airlines for MRO services and a significant increase in the digitalization of these services are projected to drive the growth of the aircraft line maintenance market. The increased demand for upgrading the existing legacy aircraft systems and replacing them with new aircraft systems is also fueling the growth of the aircraft line maintenance market across the globe. However, the lack of availability of skilled workforce and lack of common data standards are expected to restrain the growth of the aircraft line maintenance market during the forecast period. Additionally, issues associated with the compliance of various aviation regulations act as a challenge for the growth of the aircraft line maintenance market. The developments in drone inspections, artificial interlinkage, Internet of Things, digital twin, augmented reality, and Big Data analytics offer key growth opportunities for the growth of the aircraft line maintenance market. The leading players in the aircraft line maintenance market include AMECO (China), ANA Line Maintenance Technics (Japan), Avia Solutions Group (Lithuania), BCT Aviation Maintenance (UK), British Airways (UK), Delta TechOps (US), HAECO (Hong Kong), Lufthansa Technik (Germany), Monarch Aircraft Engineering (UK), Nayak Group (Germany), SAMCO Aircraft Maintenance (Netherlands), SIA Engineering (Singapore), STS Aviation Group (US),Turkish Technic (Turkey), and United Technical Operations (US), among others. These companies have adopted various growth strategies to enhance their presence in emerging economies across the globe.